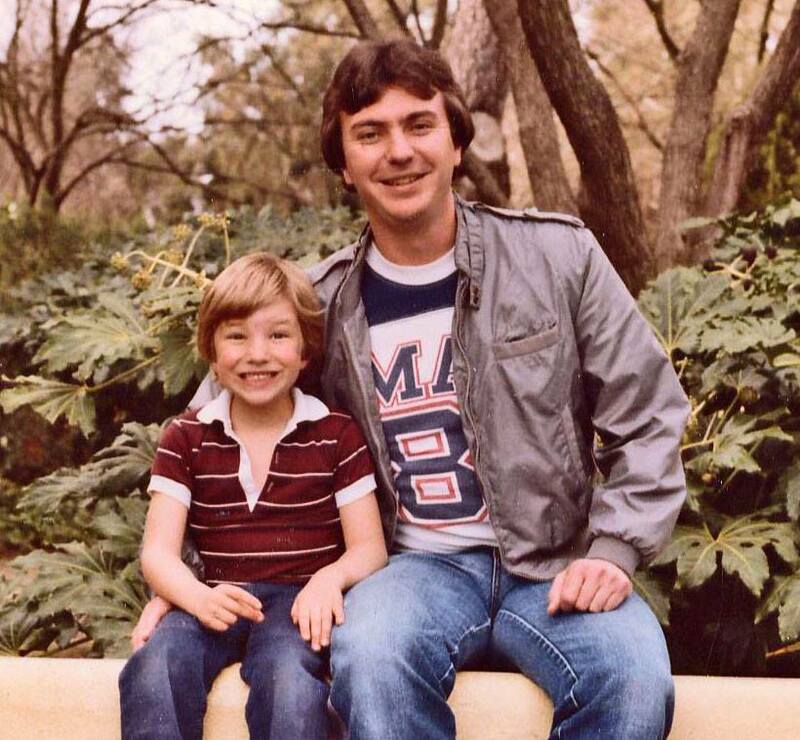 Jeremy and me, the early 80s, Fairytale Town at Land Park, Sacramento..
One of my favorite movies is Defending Your Life starring, written, and directed by Albert Brooks. It’s about a man who dies on his birthday and wakes up in Judgment City, a Purgatory-like waiting area where he must justify his life in order to proceed to the next phase of existence. It’s warm and funny and will keep you examining your own life for a very long time. My son Jeremy loves this movie as much as I do and today is his birthday. On my birthday 17 years ago, shortly before he died, my dad told me he couldn’t believe he had a son who was 50. I know the feeling. Jeremy was born 42 years ago today. Like all loving parents at this age I understand that he’s an adult with a family of his own and our relationship has grown with us. But like all parents, in my heart he will always be my little boy. You have to be careful about that when you talk to a middle-aged child. Occasionally I still have to stop myself from calling him, “Kiddo”. I’m not going to wax poetic about Jeremy and me. Many fine words have been written about ideal father-son relationships and the bonds of love that can’t be described. I have nothing to add. We know how we feel and how we’ve enriched and informed each other’s lives. I am a far better person for his existence than I would be without his love, influence and instruction. Parenting is a two-way street. You get as much as you give; you learn at least as much as you teach, probably more. If you’re happy with who you are today you can thank your children in large measure. Beautiful, beautiful, beautiful. I have always admired this particular father/son bond. What a beautiful relationship you’ve built with your son! Happy birthday Jeremy! As always your observations speak to me. I never get tired of reading your thoughts, and find that more often than not they reflect my own experience. Thank you for sharing the gift of yourself with others.